It was a 1967, Canada’s centennial year. Our neighbor, Ross Hoover, was selling real estate. 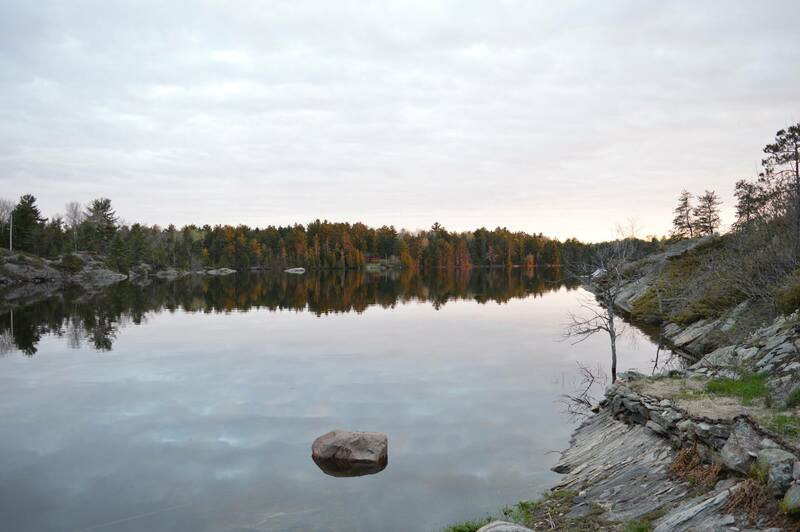 He had a listing for fishing lodge on the French River. Ross, his wife Pat and my husband, Don, were all avid fishermen. That ad sounded interesting and Labor Day Weekend was coming up. The four of us were heading north. We drove down to the Harley Bay Road into the bush. There were lots of twists and turns, lots of trees and rocks before we, finally, were at the marina. We hired a water taxi to the Bear’s Den. It was a dark dull fall day. I remember the first view of the lodge. It was very impressive. There it sat, red and white on its perch, high above the water. It looked massive. 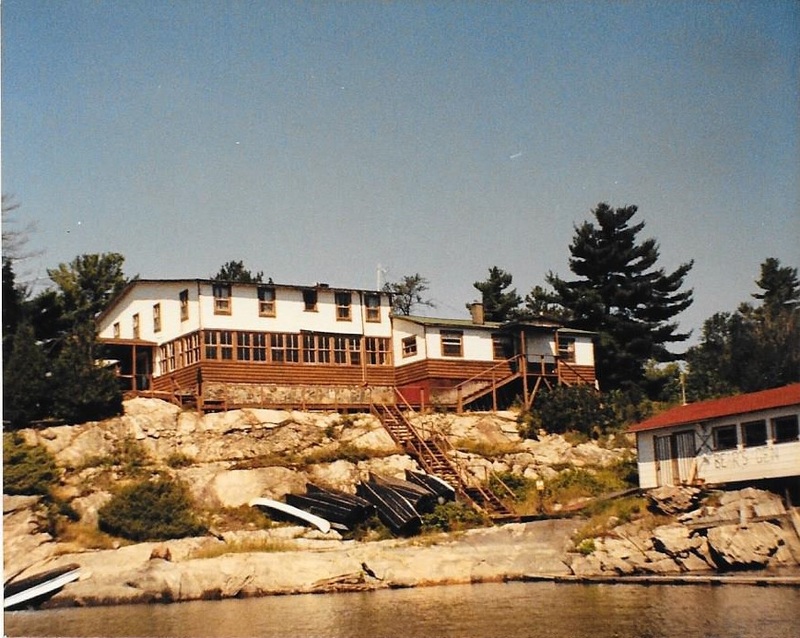 We landed at the dock, climbed the many stairs and entered the main lodge. The large open area was dominated by the wood burning fireplace, surrounded by stone. A balcony was around the room. They were animals heads, deer and fish mounted along the walls. The dining room was bright and it looked out over the dock and the water. The bathroom and bedrooms that opened onto the balcony. The bedrooms were neat, clean and rustic. We were impressed. The kitchen had a large propane stove, two propane refrigerators and a large staff table. There was a staff bedroom and living room. The owner was Bill Maxwell and his wife, Marion. The price was $42,000. We were impressed but we were uncertain of the funding. We discussed a partnership and decided that was not the way to go. Don and I decided to bite the bullet and buy it. Our new home was put up for sale. The deal was completed and we were officially the new owners of Bear’s Den Lodge. 1968, was to be our first season, and Bill Maxwell held the mortgage. We hired, Mr. Bouchard as the cook and handyman and Mrs. Bouchard as the young woman to look after our daughters, Elizabeth and Bonnie who were four and five years old. Next, we hired a dock boy & two guides, Glen Lankin and Steve Cheverette,and two waitresses. Announcing our new business, we next mailed out newsletters to all the former guests. The ice went out in early April and we arrived to prepare for the mid-May opening. There was no Hydro. The power depended on our gas generator that also powered our radio phone that we had purchased in Parry Sound. The water pressure also only worked when the generator was powered. In the fall, all the water pipes were drained and all the bedding was washed and stored. The washing machine was a large wringer washer and the dryer was a clothesline. All the ice was cut in the winter by the Palmers and stored in sawdust in the ice house, for ice all summer long. Sometimes the ice blocks were up to 30 inches thick. The groceries were mainly bought from the wholesale in Sudbury. A big order of supplies was bought in the spring, but it was necessary to make a weekly trip into Sudbury for fresh supplies. The propane fridges only held a week’s supply of meat. Supplies were brought from the dock to the kitchen in a box on a track pulled by a winch to the kitchen landing. When our first little groceries was coming up, the wire broke and the load flew from the track into the Bear’s Den Bay. Don and I were in the main lodge with guests. Glenn and Steve rushed in to tell us. Their faces were white as ghosts. They had jumped into boats and had attempted to save the items that were floating. Bales of coffee were saved and set out to dry. Canned goods sank. We were able to hire a driver, a friend of Mike Palmer. He was able to bring up a lot of items. He said it just looked like A&P but no labels. All summer opening cans were a surprise, things like toilet bowl cleaner would pop up. Early spring, I remember helping to put the boats into their slots while slipping and falling into the frigid water and swimming over to the dock. Bonnie and Elizabeth were not allowed on the dock without their life jackets. One day Don picked up one of their life Jackets and found it been waterlogged, it weighed a ton. After that they swam without the life jackets. Elizabeth would spend all day fishing from the dock. She would fill a cooler with rock bass and other panfish when she was done she would empty the cooler into the bay so she could catch them again the next day. The opening of the lodge was a big event. Our farmer friends, Dorothy and Jim Ferguson always came to help. Don was sick in bed with a migraine so Jim and Glen went out to meet the train. The group was coming from Toronto and had lots of time for liquid refreshments. Jim and Glen had to take the boats (1½ miles) and then the vehicles (12 miles) to meet the train. They loaded the inebriated guests into the vehicles, into the boats,and finally they got them up the many steps. Dorothy and I had prepared sandwiches and coffee. As they came in the door, I put out my hand, “Welcome to Bear’s Den” and the lights went out. The generator had died. Jim thought running a lodge sounded exciting but after that he decided to stick to farming. Kathy was learning to be a waitress. When serving the pie, it slipped from the plate and landed upside down on Don’s lap. She said, “Oh, I am glad it landed on you.” One day we were in the main lodge, talking to guest, waiting for dinner. A gentleman said to Elizabeth, who was four years old, ” My you have pretty red hair. Where did you get your red hair?” Elizabeth and her innocence replied, ” The milkman.” Don and I were embarrassed but deserving. It had been a family joke to say we had a red haired milkman when people questioned the color for hair. Elizabeth and Bonnie had to go a mile in half by boat and 6 miles by car to meet the school bus. This was done twice a day in May,June, September and October. Because of this, Don gave me my first lessons in driving a boat showing me forward, reverse before pushing Donnie, Elizabeth and I away from the dock. I guess we managed but I probably wasn’t very smooth docking at first. While we meant well this at times proved problematic as there were times our kids would wait to meet us after school. I can remember one time I found them sitting on a rock in the middle of the bush waiting for hours as school had been dismissed early. Elizabeth and Bonnie could not call us because the radio phone had no power since the generator was being worked on by Don in their absence. This was hard on Bonnie and Elizabeth, even more so as they went to a French school for their first year. Elizabeth was in kindergarten and Bonnie was in grade one, however, it was not a good plan. They were asked to change their home, their friends their school and their language because of us. Bonnie had lost her self-confidence for not being a native French speaker and being picked on by her peers because of this. The following year Don and I decided they might be happier if they went to an English public school even if it was further for the two. We had guests who had been coming to Bear’s Den for many years. Each year we groups of men and families that had their family reunion at the lodge. Dr. John and his family came yearly from Pennsylvania. We looked forward to their arrival to catch up on the family news. Mr. Jim Ryder, a guest from Rochester, New York, came for a month in the spring and another month in the fall fishing for muskies. Mr. Jim was a sweetheart and was just one of the family. He knew the history of Bear’s Den though I wish he had recorded his knowledge. Bear’s Den was built by Mr. Martin, a retired diplomat in the early 1920s. All materials were brought in by a train and carried to the building area by a barge. Many of the furnishings were original. One of Mr. Jim’s largest catches was a 42 pound Muskie. Don had his picture taken with that catch and it was good publicity for the lodge. Our same year brought new staff, Mrs. E (Elgie). She became a dear friend worked for us until we sold. Our staff included Adrienne from Pa, an expert guide. Sue Thompson, Mary and Elizabeth McGugan and Linda Casler Buchanan. When I was by myself in the fall or spring, I would phone Linda and she and her husband, John would always save me. We had a new dog, another black lab, Major. We had guests who had a little tea cup terrier. The lady had fastened the dog’s hair in a little bow was sitting on the front porch. Don and Major returned from their morning walk. Major went over, sniffed the little dog, lifted his leg and peed all over it. Mr. Jim Ryder said to Don, ” Well I guess we know when Major thinks of that dog.” It was another embarrassing moment. One of the local characters was Sylvester. Sylvester was an older first nation gentleman who lived close to Hartley Bay. Sometimes Dr. John would hire him to guide. One time Sylvester arrived and he was stinking drunk. Don set him up to the kitchen and asked me to sober him up. He managed to pat me on the behind. I told him if it ever happened again, I would push Sylvester over the railing and he would land on his head at the dock. Sylvester dyed his hair black with black shoe polish to hide his graying hair. Sometimes in the summer he would ask to hitch a ride to Sudbury when I made my weekly shopping trip but on one very hot summer day as he was riding, the shoe polish had ran down his face by the time we got to town. Needless to say, it made our experience much more interesting. The second season we met the Mayville family from Cleveland, Ohio. We became good friends and we planned an exchange. The Mayville would exchange a week at Bear’s Den for a week in Cleveland as we would attend the Cleveland Sports Show. It proved to be a good exchange and we gained many good customers from Cleveland. One spring I hired a woman to work for us. Her name was June Smith. Help was always available in the summer months but it was difficult to find help in the spring and fall. I thought June would solve my problem. On the trip north June told me she had a daughter in a mental health facility. That was the first indication I might have a problem. She worked well and so guests arrived, then she began sampling the bottles. One morning she was too drunk to find her way out of the dinning room during breakfast. It made the guests uneasy and was embarrassing. I could vividly remember the Don’s expression as he said to me, “You hired her, you fire her.” I know what I had to do but I at the time I couldn’t bring myself to simply say those words. She was daring me to fire her. Luckily for me, her boyfriend was coming for the weekend. I had a quiet talk with him. I explained June was not happy and I asked him to take her back to London. I didn’t hear from her again until I sadly I saw in the newspaper, June was killed crossing the street in front of the hostel where her daughter was. One morning in early spring, Don was hooking up the water pipes. Bonnie came running into the kitchen, her hands over her ears she said, ” the air’s blue.” The guess was Don had some choice language before finally finishing. When one of the first groups arrived in the spring, they had a big laugh. Unknowingly, Don had reversed the hot and cold water and every time any of guys flushed the toilet the steam would rise out of the bowl. They said it was neat giving a sauna with every flush. The generator was temperamental. Don usually turned it off about 11:00 PM. The routine was a warning, wait 5 minutes and then off. The warning gave everyone a chance to head to bed. One night he just pulled the switch and everything was black, we had a guest who arrives with his leg in a cast. He had his leg in a garbage bag and was in the shower when the lights went out; you can imagine the confusion. One summer it was prank time. There was water flying around every corner. Beds were short sheeted, shoes so we’re nailed to the floor. I was called out on the kitchen porch. I was lucky. Glenn was on the floor with the water bucket it was ready to pour, when he recognized my head and stopped. We knew we would probably have to sell. The girls would soon be in high school and would not be able to transfer back and forth. The operation needed both of us. Ed Crane and his wife, Monique wanted to buy the lodge. He was an insurance man from Alymer. He was sure he could run it much better than we did. He made the mistake of telling us that and we decided to see. He only lasted two years, even though the Hydro had arrived with all the modern conveniences. Bear’s Den was an experience. I am glad we were young!